Click here to DONATE to support the care of Jedare! 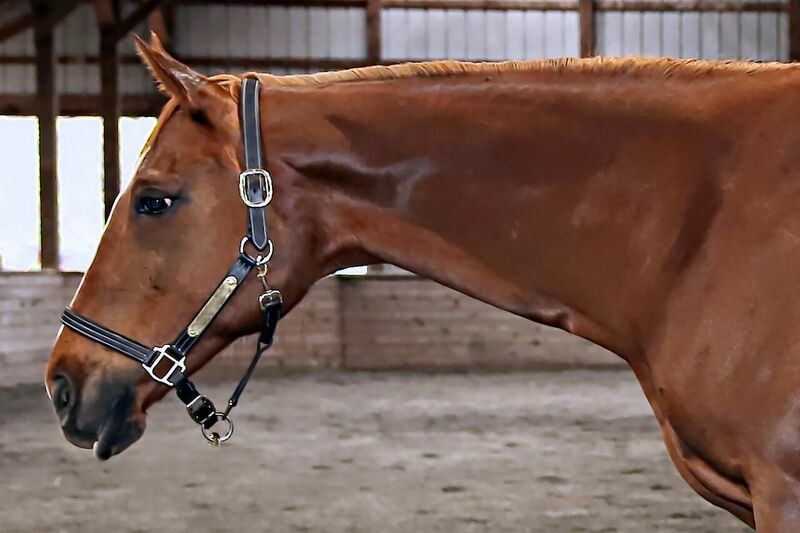 Offered by R.A.C.E Fund, Inc.
Jedare is a 16 Year Old Chestnut Thoroughbred Mare. She is currently doing Walk/Trot/Canter under saddle and has started over fences. 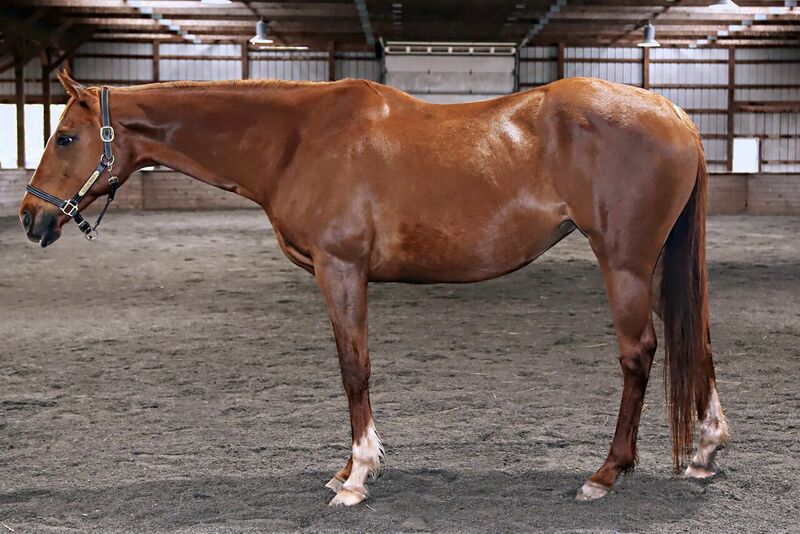 She requires an experienced rider or an intermediate rider working closely with a trainer. Looking to be a possible good hunter/jumper or dressage prospect and is ready to finish her retraining with the right adopter. She has gone out on hacks alone. She is up to date on all of her vaccines, teeth floated, current coggins. Jedare is a sweet and intelligent girl to be around and groom. Solid built. No vices. Discipline: Dressage, Hunt, Jumping, Pleasure. On a scale of 1 to 5 with 1 being Calm and 5 being Spirited, Jedare is a 3.00. Jedare is a sweet and kind mare. No vices. Jedare is little but she is mighty and would do great with that one special person she can call her own. She is a sweetheart to be around and she is the most photogentic girl so some great photos and memories in store for her with her future adopter. Jedare is located at Breezy Hill Stables, 15117 Mud College Road, Thurmont, MD 21788. Horses are stalled for 4-8 hours per day, on average. We normally do not ask for an adoption fee but rather that the adopter make a donation to our organization. 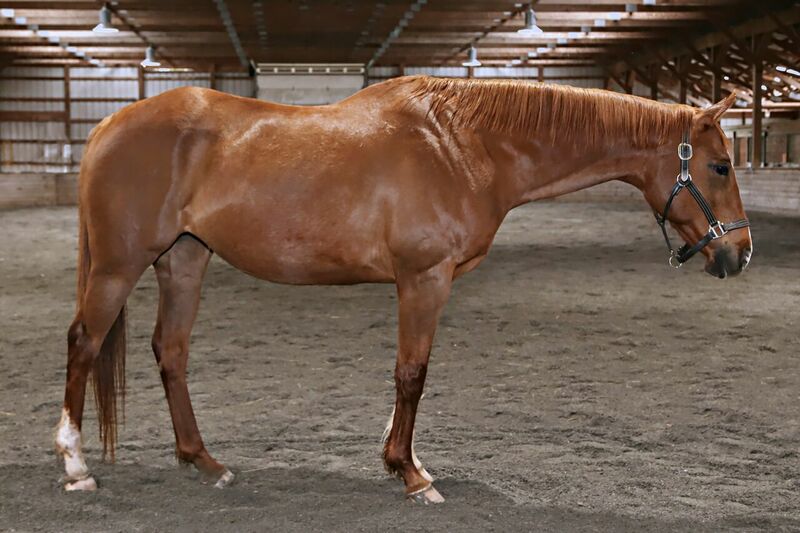 Depending on the amount of retraining and age of a horse we may apply a set adoption fee. To preserve the lives of thoroughbred racehorses and racetrack pony horses who can no longer race or work by facilitating and providing for their care and well being during their transition to retirement, sanctuary care and or adoption. Uphold the integrity of racing by encouraging horsemen and the racing industry to give back to these gallant creatures who have given so much to them. Work to put an end to horse slaughter in the United States. We help thoroughbreds retire from racing but also rescue many thoroughbreds from going to slaughter. Horses that are able to go in to a second career are retrained. We provided sanctuary and long term care for long term retirees. N/A However, we do provide education materials at racetracks and expos about racehorse retirement and rescue and educate about horse slaughter. President, manages the organization on a daily basis. No compensation. All volunteer organization. An outside accountant handles our Quickbook financials and monthly reports. Secretary-Treasurer, does the minutes for our board meetings. No compensation. All volunteer. Board Member, attends board meetings. No compensation. All volunteer. We may possibly consider accepting a stallion in an absolute emergency situation and providing we have the accomodations at the time. The horse would need to be gelded within 30 days of arrival weather permitting. Our organization does not allow breeding of any mares that come into or adopted from our organization. Any stallions must be gelded before arrival. We have had a boarding agreement with this facility since 12/08/2014 on a monthly basis. 30 day termination notice is required. Our sanctuary horses have their own 17 acre pasture with three run in sheds, automatic waterers. Our horses in retraining each have a stall in the barn. Breezy Hill Stables is responsible for the feeding and daily monitoring of our horses. We are in constant contact with them and direct them in the care of our horses, etc. We board one retired horse at this facility and have a boarding agreement with Historic Long Branch that began on 09/12/2012 and is on a monthly basis. 30 day termination notice is required. We do not lease the facility. We pay board for one horse each month. We have a board agreement with this facility beginning on 01/01/2014 month to month for one retired thoroughbred. 30 day termination notice required. Our horses uses one of the pastures at this facility and we pay the owner a monthly fee each month. The owner of the farm provides hay, grain, automatic waterer, de-wormings, run in shed. We alsp [ay for farrier, vet care, vaccinarions, equine dentist. We have a boarding agreement with the owner of the farm. 30 day termination notice. The owner feeds in the morning and when necessary in the evening for us. He also does morning turnout. We take care of the horse and schedule and pay for any hoof trims, vet care, equine dentist, etc.